First things first – my day started with the alarm waking me up from another good night’s sleep. Somehow (more by luck than design, obviously) I seem to have avoided jetlag. 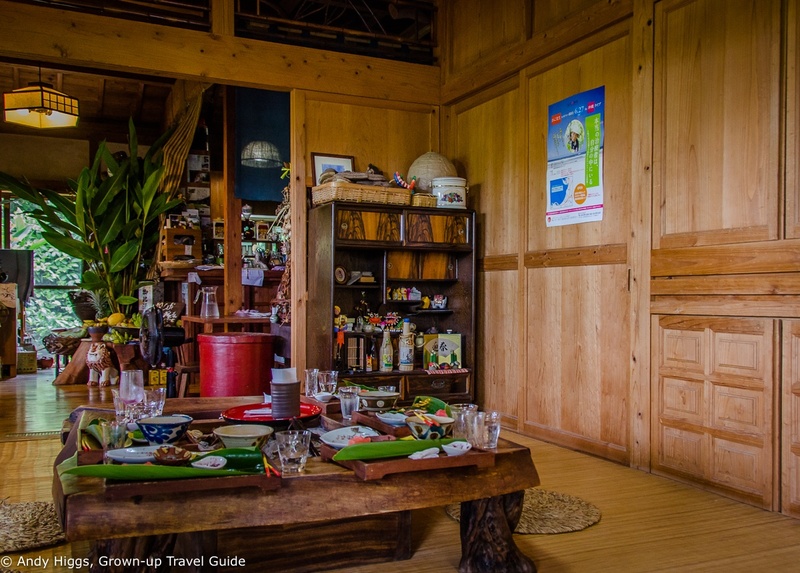 After showering and getting dressed I went downstairs to breakfast at the Loisir. This time the buffet was mixed – meaning there were both Japanese and ‘western’ staples. I went for the former and it was pretty good but nowhere near the standard of the Naha Terrace yesterday. Still, enough to keep me going until lunch. We had to check out soon afterwards and met in the lobby with our bags where Seiko and our driver were waiting once again. After loading up we hit the road, this time heading north for the central part of the main island. 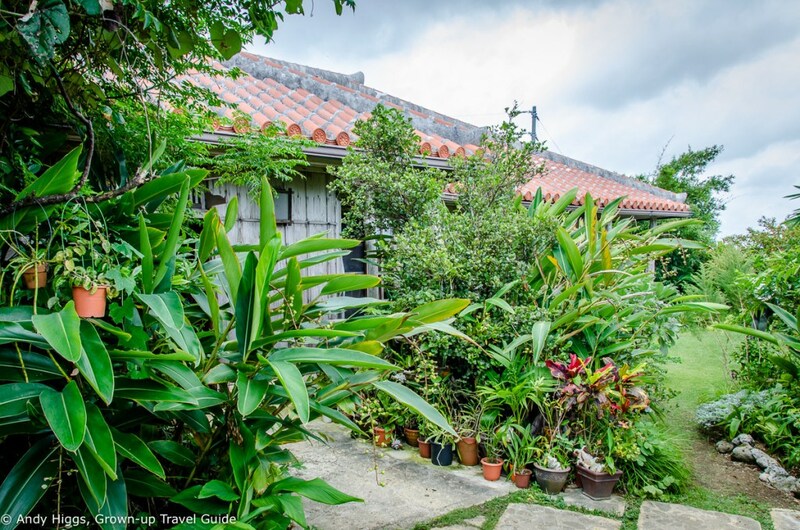 This area is where Okinawa almost feels like an American colony – if you drive the coastal road you will pass huge base after huge base; we took the expressway and even then our route took us past several enormous military facilities. 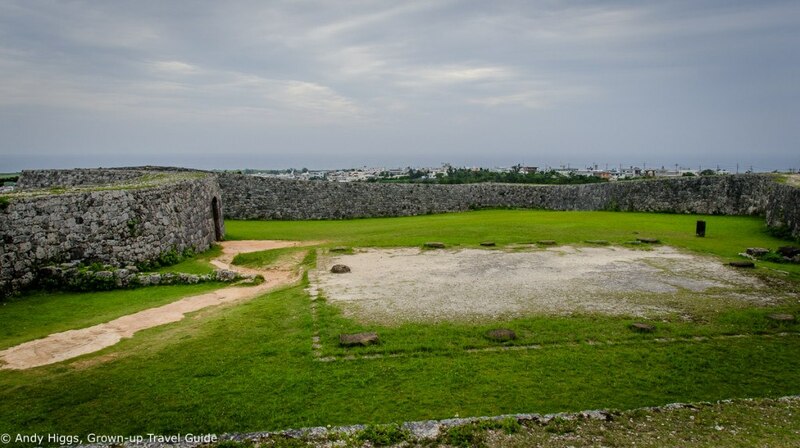 Whatever you think of the politics it is certainly jarring to see such large-scale bases and airfields and row after row of shiny military vehicles behind massive fences right in the middle of what could have been an Okinawan town. 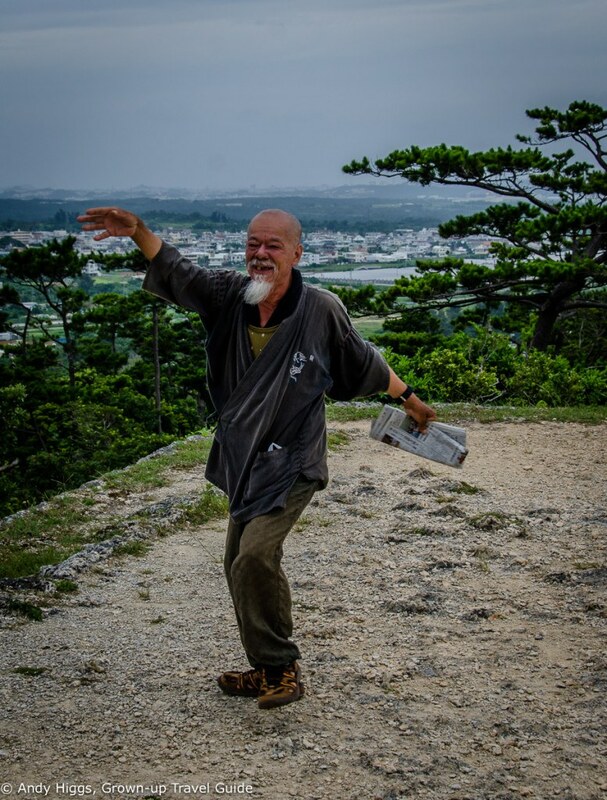 To fully understand the scope of the American presence on Okinawa, a few facts are overdue here: US military bases cover some 20% of Okinawa-Honto and a few of the outer islands, employing approximately 27,000 American military personnel. It’s not just these numbers that rile the locals, though – it’s the fact that Okinawa accounts for less than 1% of the Japanese landmass but hosts 75% of the country’s US bases. But it’s also not that simple for the islanders – thousands of them work for the US military and America provides a major economic boost for what is in fact the poorest of Japan’s prefectures. 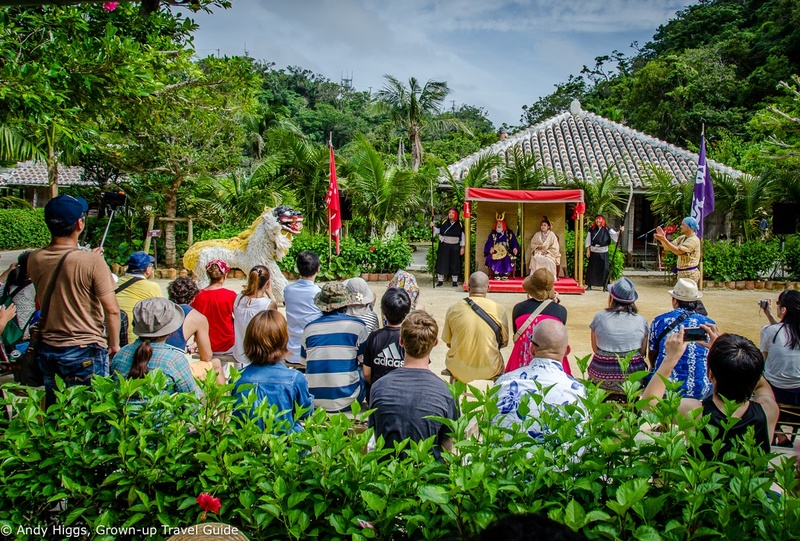 A lot of younger Okinawans are keen on the weird mix of cultures while many older ones have had enough of the US presence; opinion has bounced from one side to the other in recent decades. The hot potato right now is the planned relocation of Futenma which is just outside Naha City. The proposed new site is on a pristine beach which has angered both environmentalists and those who want the base off the island entirely. With China’s somewhat aggressive actions in recent years the removal of US soldiers is off the table, and it will be interesting to see how the Okinawa situation is resolved. A compromise is the most likely result and there will be grievances no matter what the outcome. After an hour or so we turned off the expressway and headed west for the coast at Yomitan and our first stop. It’s hard to find one term to adequately describe this place – I suppose ‘cultural centre’ will have to do. 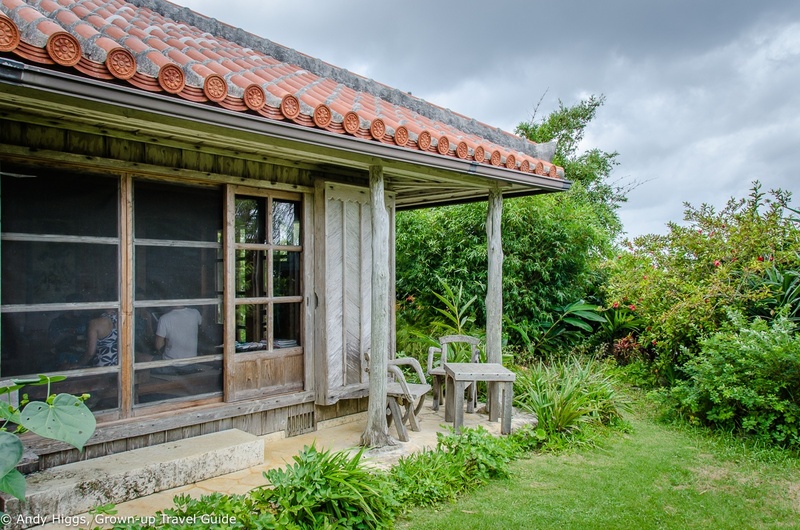 Built on an area of just under 50,000 m2, Murasaki Mura is a recreation of a traditional Ryukyu settlement that was used as the set for a famous Japanese TV series. Cobbled pathways link the red-tiled buildings and the atmosphere is rather zen-like. A huge range of activities are available here – visitors can try their hand at painting, glass-blowing, pottery, weaving, candle-making and much more. 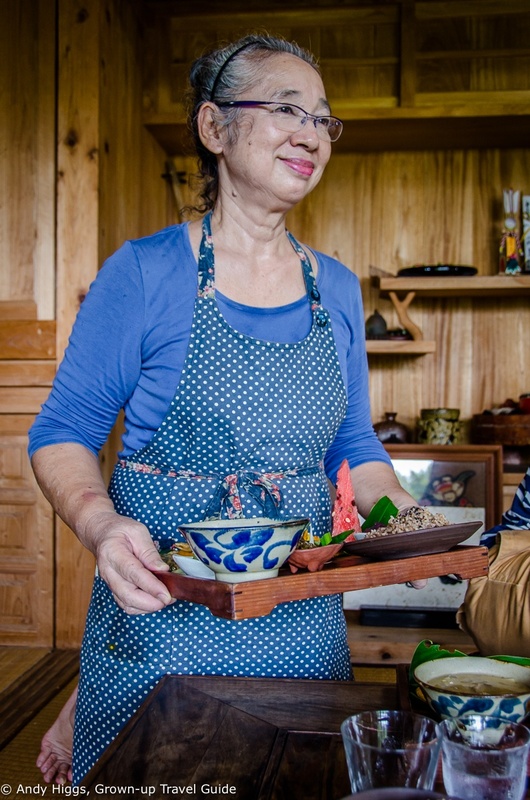 Horse-riding and go-karting are also on offer, and there is a traditional bath-house and large hotel on the site too. After changing into our robes which are included in the price for the lesson we were given an introduction into the history and principles of this martial art. 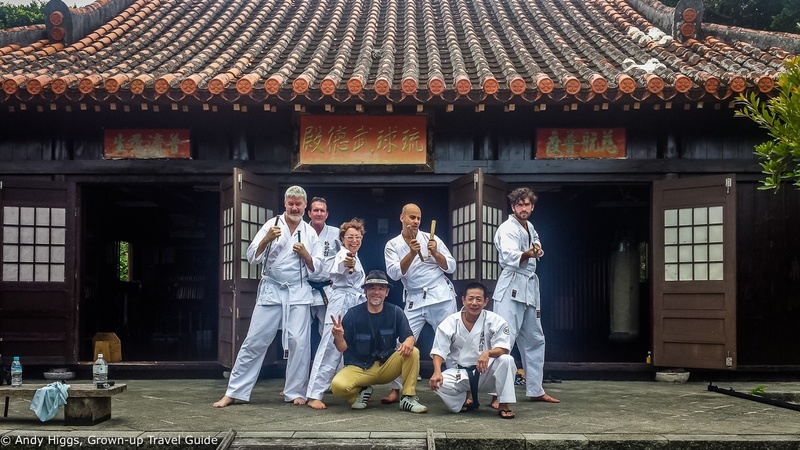 Karate began as a standard fighting system during the Ryukyu era and evolved with the arrival of large numbers of new islanders coming from mainland China. We were shown some of the basic moves before it was our turn. Happily full combat was not on the cards as I struggled just to replicate the various blocks and thrusts. But it was all good fun and very educational – and very hot. The humidity was a killer and I was glad I didn’t need to defend myself from anything other than a mild bout of exhaustion. 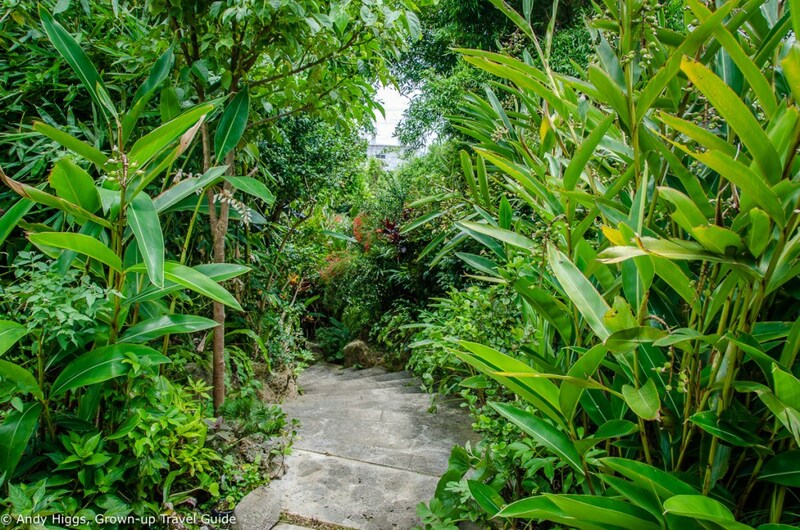 One of the major developments came as a result of weapons being banned on the island – this led to a need for self-defence using bare hands or whatever implements and farming tools were to hand. 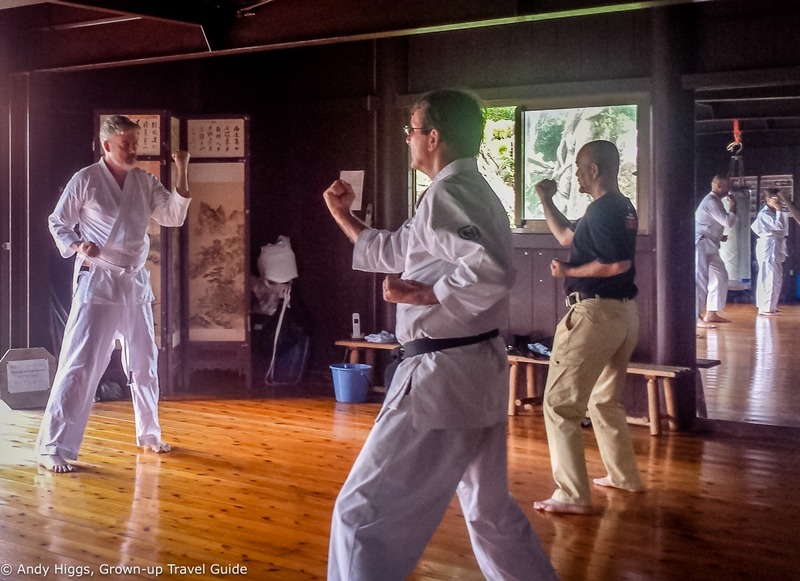 To understand karate fully would take an entire blog, not just a blog post. But a one-hour introduction is a great start and I found it fascinating – especially the emphasis on state of mind and respecting the enemy. It is also an extremely graceful martial art but a highly demanding one – you would need about two years of daily training to just reach ‘competent’ level. 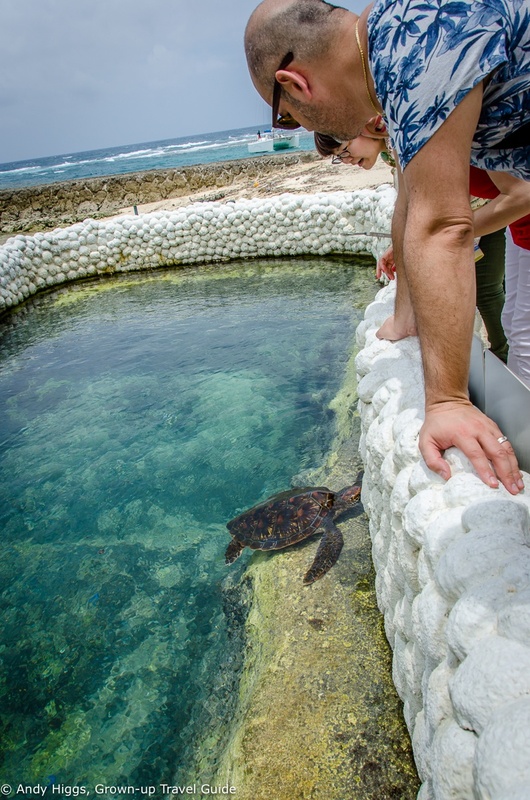 It was then time to move on – just ten minutes down the road, to a coral farm. 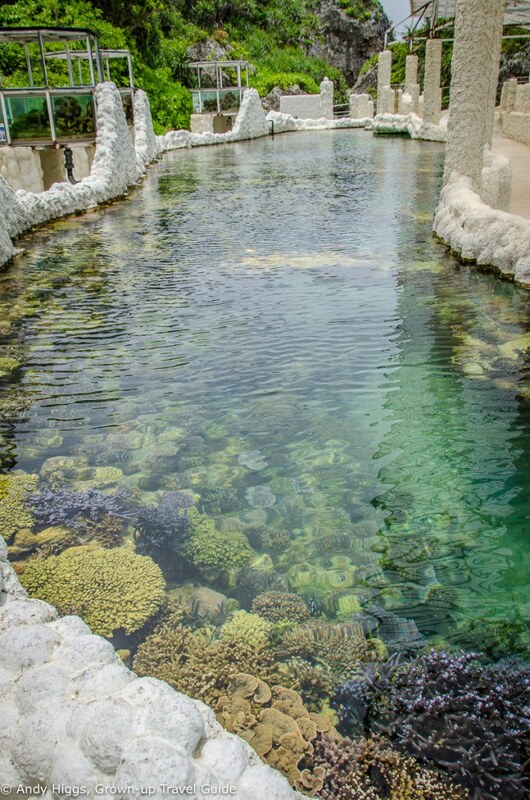 The Sea Seed Coral Farm is a man-made coral reef and research station where some 50,000 coral nubbins grow. 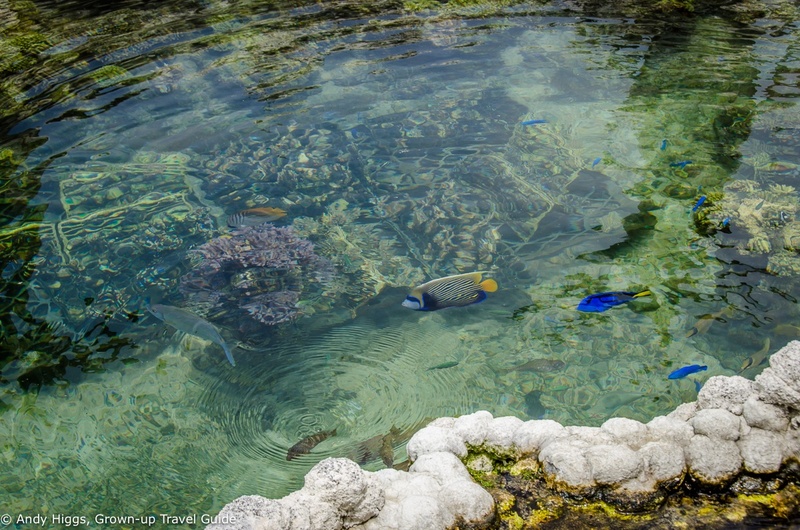 It’s a controlled environment free of predators where coral are cultivated and transplanted back into the sea when strong enough to survive. The main tank holds 10,000 coral nubbins as well as 10,000 shellfish, 5,000 crustaceans and 1,000 fish which feed off seaweed. 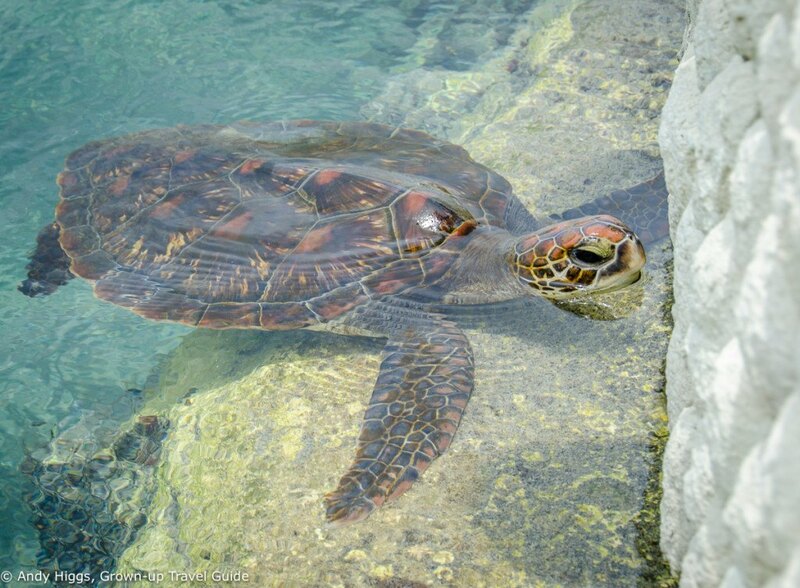 A very friendly turtle lives here too. 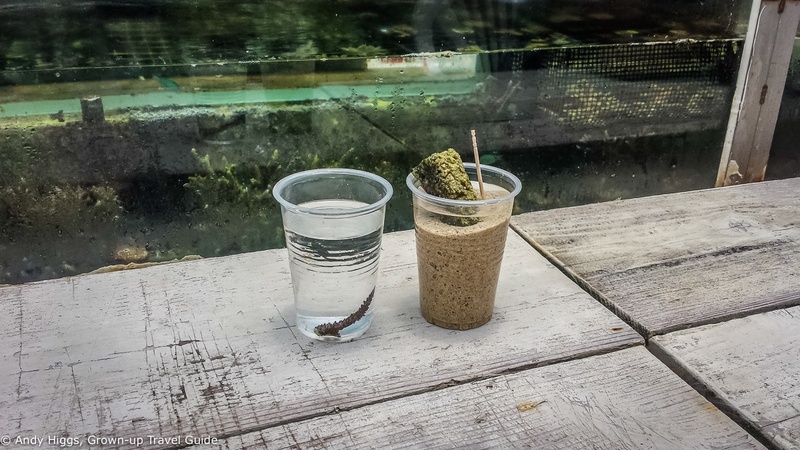 As well as observing the coral and other aquatic life visitors to Sea Seed can take part in their efforts by planting coral. 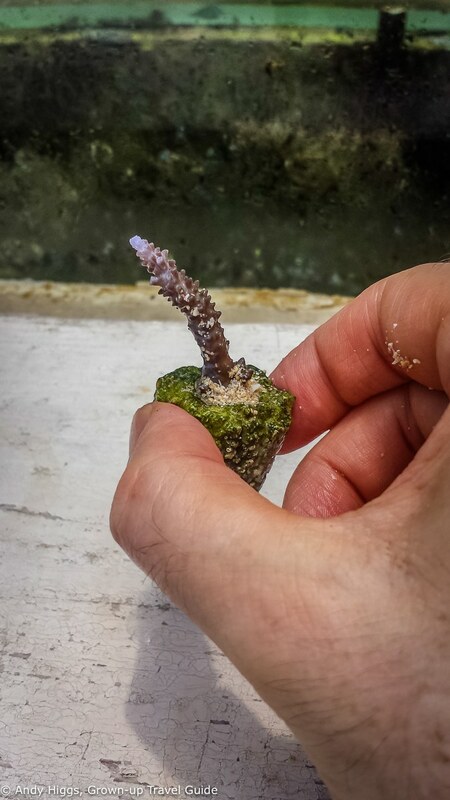 This is what you need – a coral offcut, snipped from a larger specimen, sand, a toothpick-sized stick and a piece of rock as a base. Fill the hole in the rock with wet sand and insert the coral. 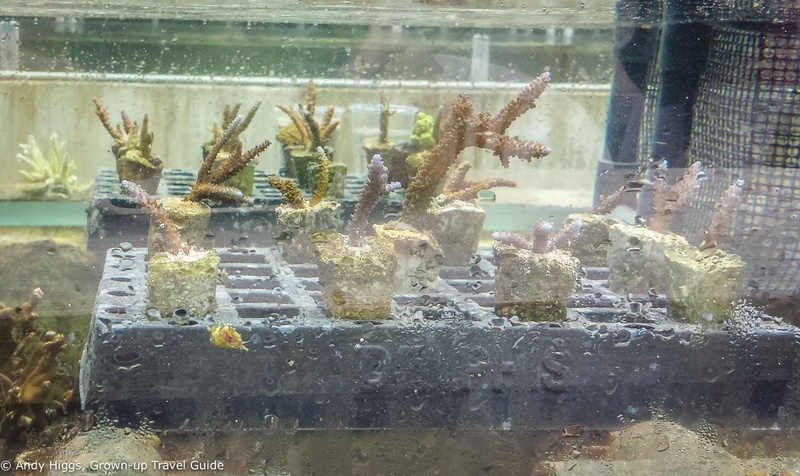 Place the coral in the tray underwater and voila – it will then grow here. In two-three years it will spawn and create new life. 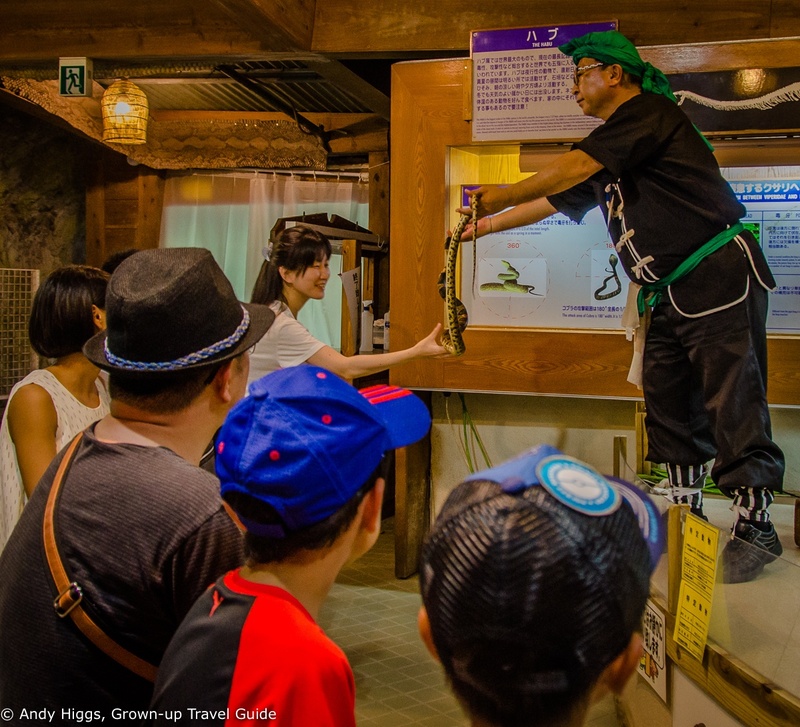 This is a fascinating experience and one where guests really feel they are making a difference – however small – to preserving and growing the protected coral reefs of Okinawa. Saving the planet is hungry work and lunchtime was approaching. 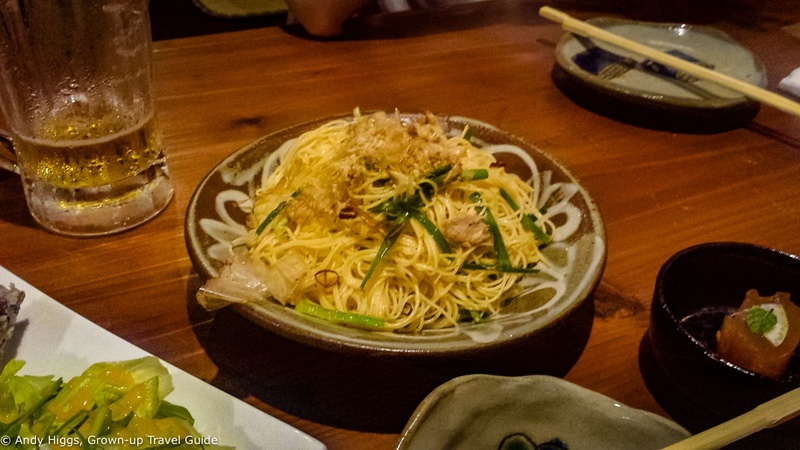 In a change to our itinerary we would now stop at one of Okinawa’s best restaurants following a suggestion from Stefania in our group. It’s safe to say that this is not the sort of place you stumble upon. Located just outside the town of Kin, with no Engish sign and hidden in a thick garden is Garamanjaku. …brings you to the restaurant. 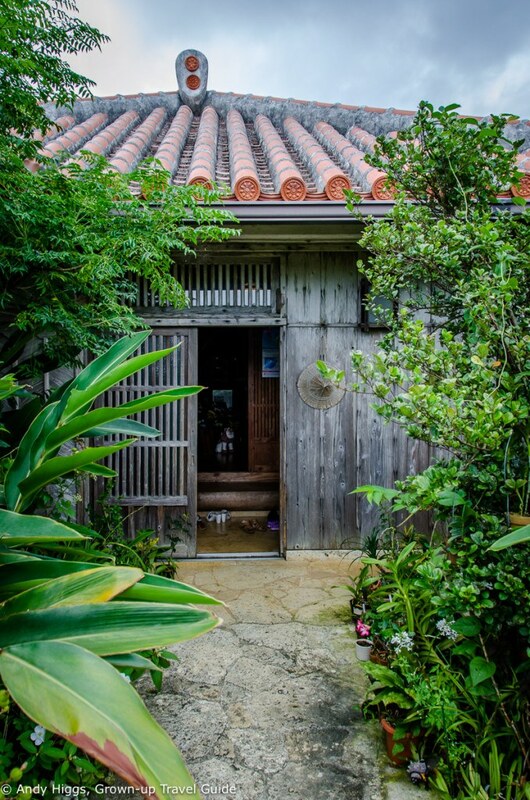 Make your way inside and you’ll find a wonderful traditional Okinawan family house. 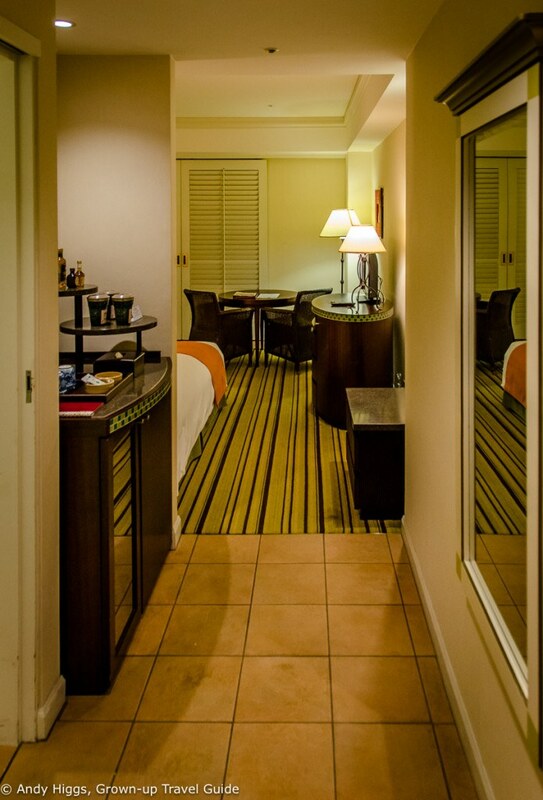 With just one main room for dining, it’s an intimate experience. After being presented with the menu we made our choices and our hostess soon brought our food. 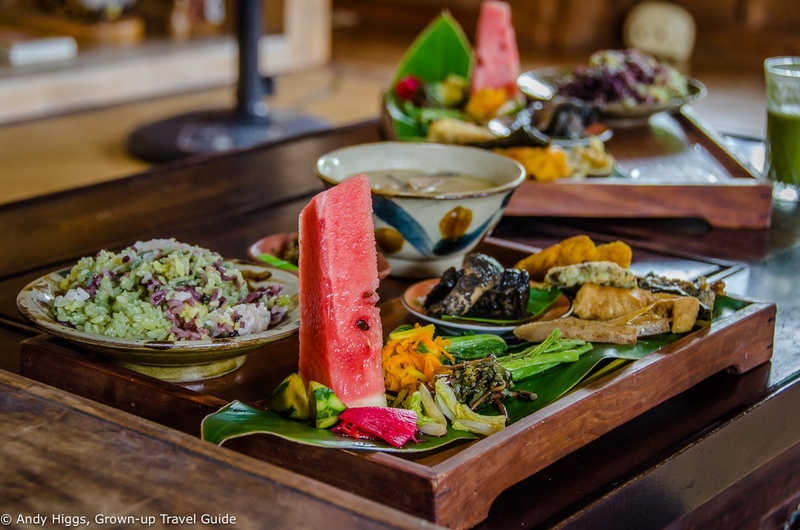 Using locally-sourced ingredients and spectacular presentation, this is a lunch to remember. Words begin to fail me at this point – not just because the food was indescribably tasty, but because I don’t know what most of it was. 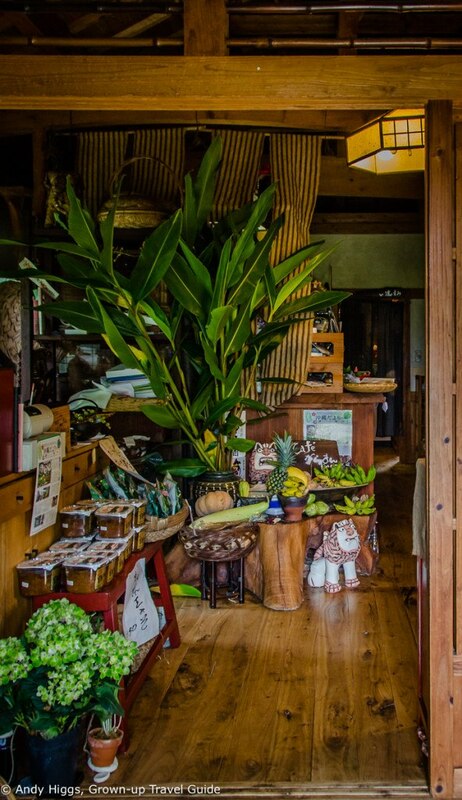 But let me tell you that this place deserves its reputation and is worth the trip all the way from Naha City. 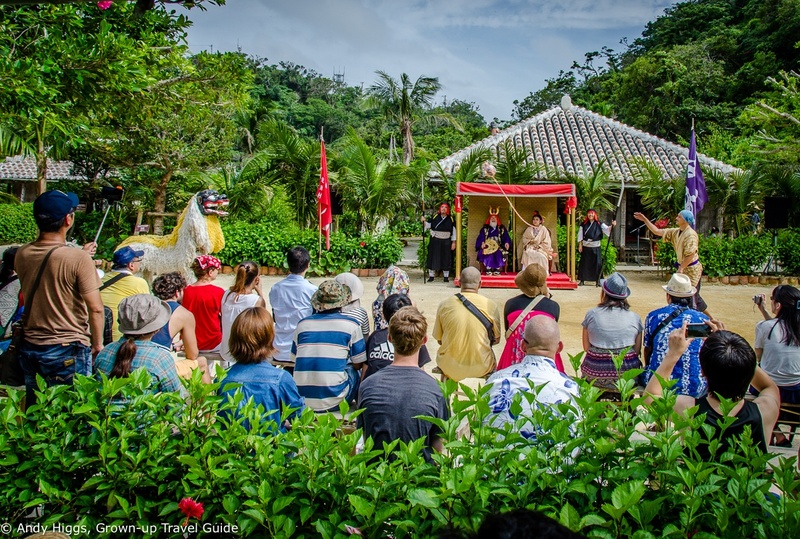 Turning back on the expressway towards Yomintan, a half-hour drive brought us to another cultural centre, Ryukyu Mura. This is a far more touristy ‘Ryukyu Village’ than Murasaki Mura and has a bit of an ‘Okinawan theme park’ feel to it. Nevertheless there is plenty to enjoy and a lot to learn for those with an interest in local history. …yes! Well done, that lion. 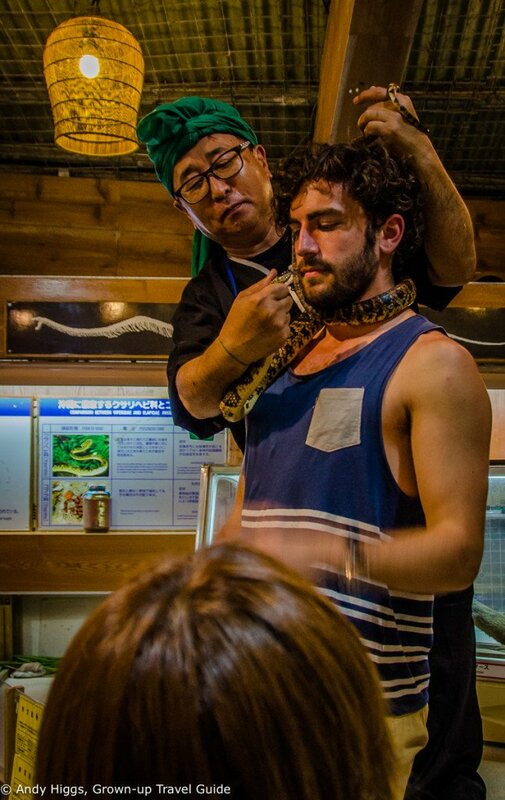 We also watched a snake show – where a trainer teased us with the highly poisonous Hubu – scourge of Okinawa. This show used to actually involve a mongoose killing a snake – each time – but happily such bloodthirstiness is no longer in vogue. 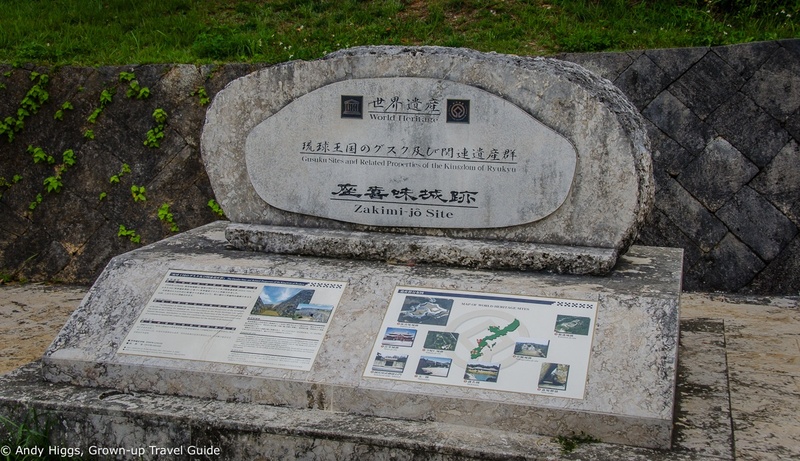 We ticked off another UNESCO site next, stopping on our way to the next hotel at Zakimi Castle. The walls and foundations have been rebuilt and it’s worth popping in for the view, too. The castle was built between 1416 and 1422. In World War II, Zakimi was used as a gun emplacement by the Japanese and after the war it was used as a radar station by the US forces. Some of the walls were destroyed in order to install the radar equipment, but they have since been restored. We were treated to an impromptu dance by this character during our visit – I can’t guarantee he’ll be there when you go though. Then it was time to check in to and check out our hotel for the next two nights. This is a huge resort hotel right on the beach with almost 400 rooms and both outdoor and indoor swimming pools. It also has no fewer than two churches for wedding services, should that be of interest. 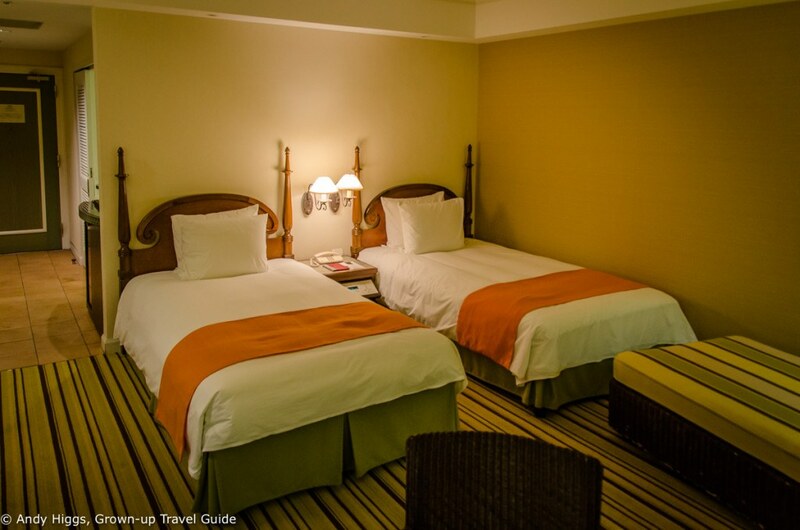 We were allocated superior double rooms which were spacious but showed a few signs of wear and tear. 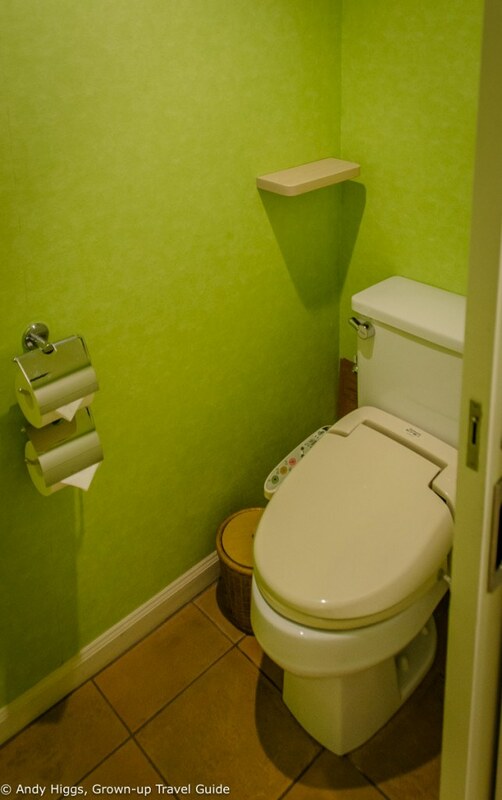 The decor was a little old-fashioned but nothing to complain about. 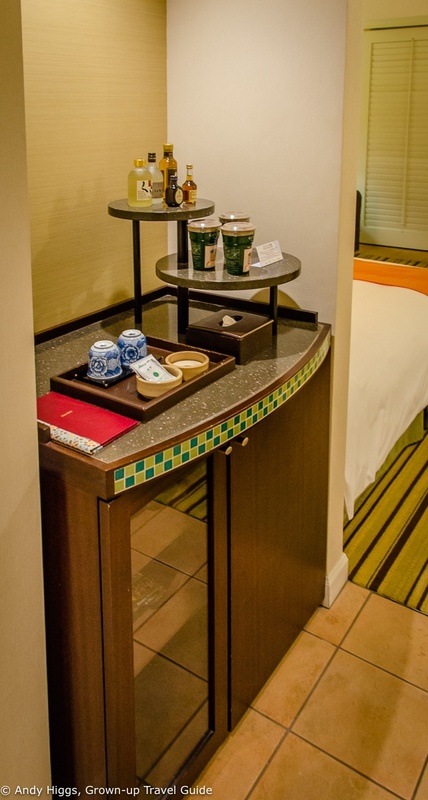 It was good to have a mini-bar and the ability to make tea and coffee, although I didn’t use any of it. 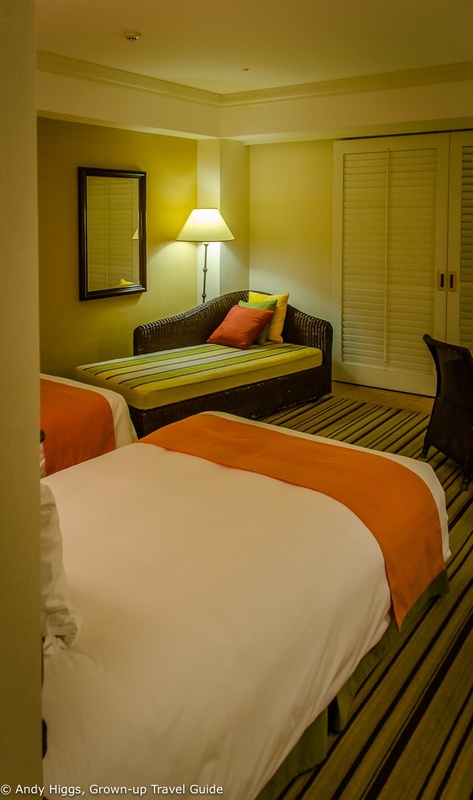 Two wide single beds and a chaise longue – the beds were very comfortable. There was plenty of space in the room and a large wardrobe in the entrance hall. 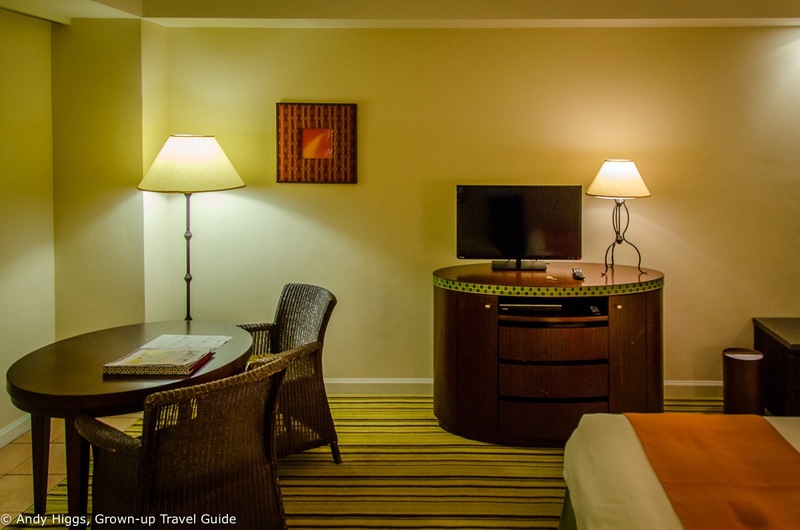 A flat-screen TV was provided but no proper desk – this is mainly a holiday resort though so not so much for those planning to work, I suppose. 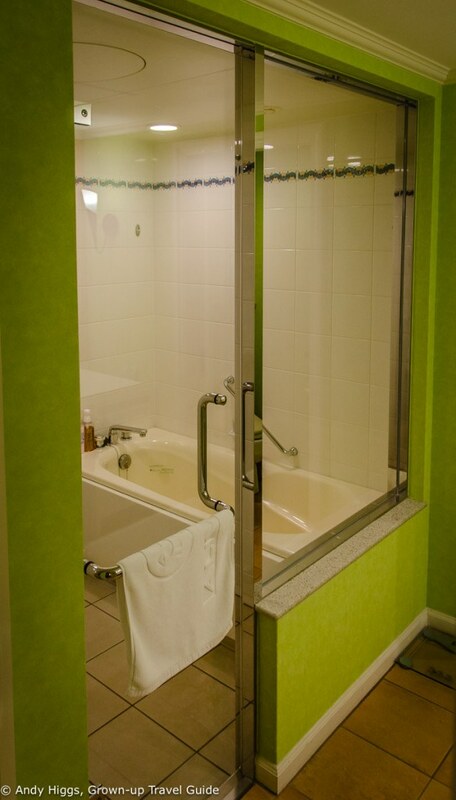 The bathroom was large, with an enclosed shower and bath like the previous hotel. 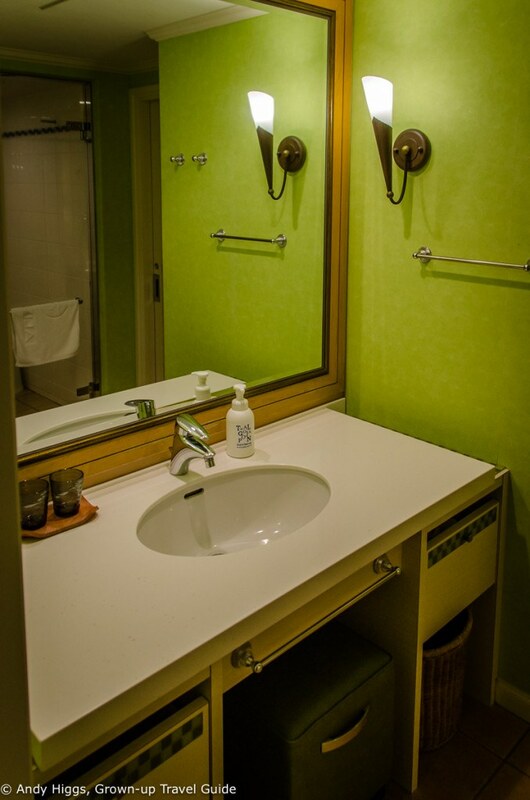 The decor here was very, er, green. 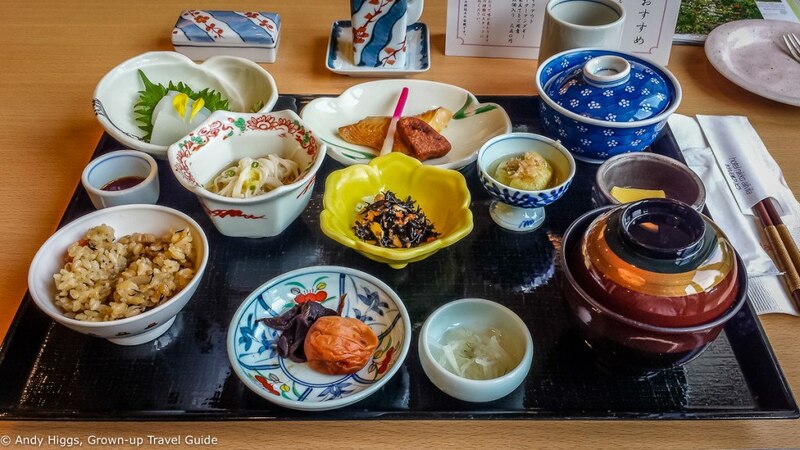 Breakfast was very good here (I took the Japanese one as usual – see above) and we also ate dinner at the beachfront restaurant – more on that in the next article. 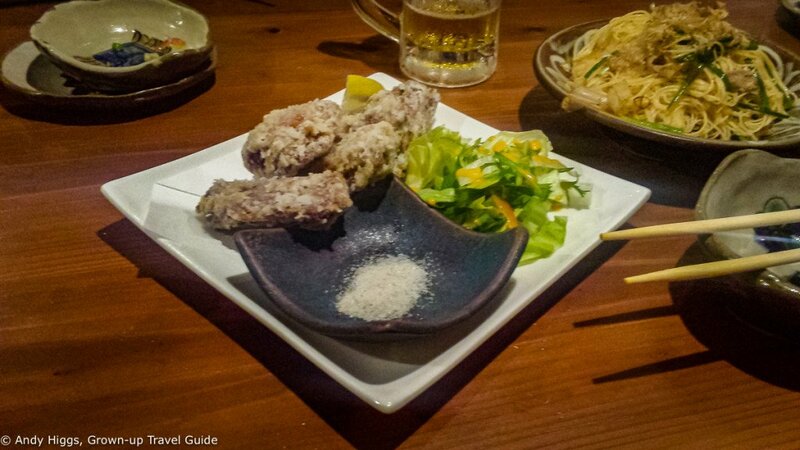 For dinner we drove to a local izakaya (tavern) which turned out to be one of my favourite experiences. At first I was a bit concerned about sitting at such low tables, but the clever thing here was that there were recesses beneath each table for your legs, so it was as comfortable as sitting at a regular height. The food was good but it was the atmosphere I really enjoyed. 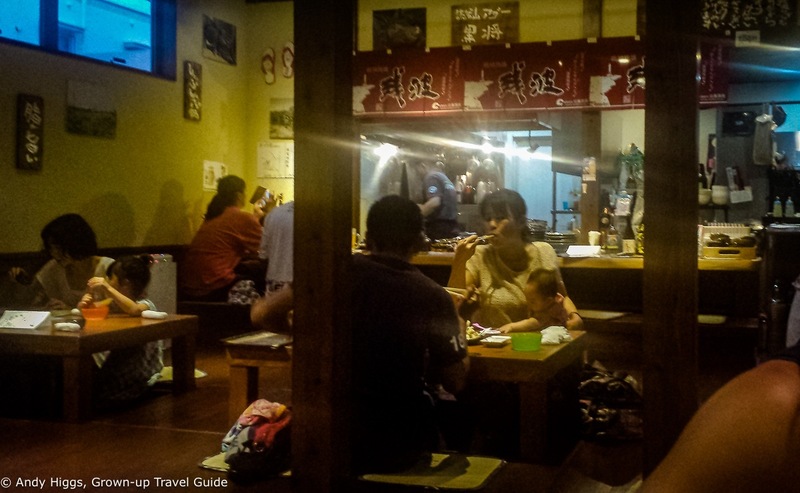 The izakaya is a laid-back experience for all the family and it was fun to eat together with a broad cross-section of Okinawan locals.